Facebook rolled out an update to its flagship application for iOS, version 8.0, and the one major change is the ability to select specific friends to share photos with, in addition to the already existing options of all friends and smart friend lists. 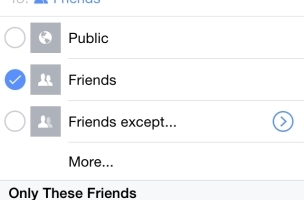 TechCrunch pointed out the similarities between the new “Share with only these friends” option in Facebook’s iOS app and the similar feature in photo-messaging app Snapchat. iOS users: What do you think of the new photo-sharing options?